This is a story about regaining lost things through the power of creation. I didn’t think I was abused as a child. I had two parents who, aside from a few brief separations, stayed together. We were poor, and occasionally the food wasn’t great, but we never went hungry, so that was a good thing. My parents both worked for the state in law enforcement, which meant they worked odd hours, and the kids had to adapt, but I thought I had it pretty good. It took a therapist for me to see why, in my 30s, I suddenly started having terrible panic attacks. My parents disowned me after I wrote about being an atheist and continued by boycotting my wedding and writing me cryptic notes about how socialism doesn’t even work. I thought I could deal with it, but it was too much. I was disowned for my beliefs and my politics. I guess my mother thought the pressure of not having her around would cause me to change my ways, and my father still thought it was his way or the highway, even for his (at the time) 33-year-old daughter. Therapy brought out a whole lot more abuse that I’d buried or blithely considered “not abuse”. Like the fractured relationship with my little brother, who has no idea how much more they loved him, protected him, and cared for him than they did with me. Unless he reads this, he may never understand that the abuse of our parents is why I won’t accept his friend requests. I practically raised him, on my own, with absolutely no tools available to me to enforce rules. If he didn’t do something I told him - which happened frequently - there was nothing I could do about it. Yet, if something had happened to him during the time I was scheduled to watch him, I’m quite sure it would’ve been my fault. It took five years of working with two therapists to even begin to unpack the trauma and learn how to feel again, something I had a hard time doing. I’d been so focused on making sure mom was happy, dad was happy, brother was safe and happy, that I never really developed the skill of determining how I was feeling. Everything felt the same, which is to say pretty bad. While I was going through this therapy, some things were ruined for me for what I thought would be forever. Any good memory with my family (there weren’t a lot, but they were there) had to be removed, dissected, and re-examined through the lens of “my feelings are important”. With those went a lot of the good memories associated with my friends, who almost to a last had obviously abusive parents or parents who abused substances or both. And, as a natural course of action, with all of those went my hometown of Bellingham, Washington. 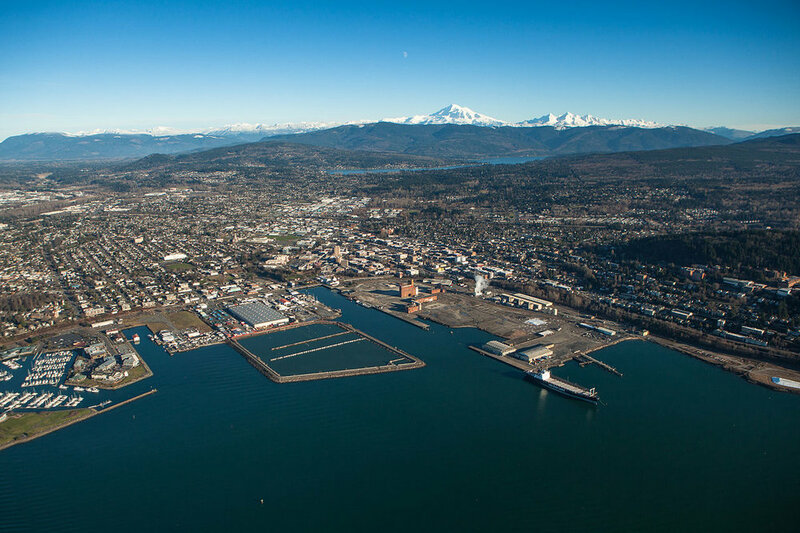 Bellingham is a small city on the Canadian border in the far northwest corner of Washington state, originally the home of the Salish Lhaq’temish or Lummi People. The city was founded by loggers, coal miners, gold miners, and fur traders. It has a nasty past of being a sundown town. I spent my growing up years there, 8 to 18, and Bellingham became part of who I was. Until Tales from the Loop appeared in my life. I was born in 1975. My key growing up years, 10-15, happen to correspond to the ages of the kids in a typical game of Tales. The kinds of things kids do in Tales are the kinds of things me and my friends would do whenever we got our freedom. Bike around town and tell our own stories. Bellingham is small enough that starting at around age 12, we could bike, walk, or take public transport for a quarter anywhere in the city we liked. I don’t like running games in US cities I’ve never been to, so my first inclination on deciding to run Tales was to move the US Loop somewhere I knew well. That somewhere is Bellingham, which I think is perfect. It’s small, but not tiny. There’s an enormous coal mine underneath the city that makes a perfect place for the portion of the Loop that runs through the city, and the cooling towers could easily be placed in the Birch Bay/Blaine area, where there are oil refineries, now. In-between those two places, there’s a whole lot to work with, including a lot of wilderness to get lost in, and even a volcano nearby! When I started, I was worried I wouldn’t be able to write the adventure. I feared all the detritus I’d kicked up during therapy would ruin those memories, kill that place in me that was Bellingham. Honestly, I think I believed I’d start this grand idea, but never finish it… it’d be another one of those things I put back on my shelf and forgot about. Now this, this is the kind of nostalgia I can get behind. Rediscovering my childhood has been so much fun, and giving that gift to the players at my table has been incredible. It just goes to show you, time can heal at least some wounds, and RPGs can give a great creative lift to those seeking a way back home.